In the early 1920's, gangs of outlaws roamed the state terrorizing the citizens of many Oklahoma towns. These gangsters often escaped lawmen by fleeing across county lines. The U.S. Marshal's Service was the only law enforcement agency with statewide jurisdiction, but its officers were outnumbered by the bandits. In 1925, Governor M.E. Trapp recommended the creation of an agency of special investigators to combat the outlaws. As a result, the legislature appropriated $78,000 to establish the State Bureau of Criminal Identification and Investigation, now known as the Oklahoma State Bureau of Investigation. A year after its creation, the Bureau's three agents were credited with reducing the number of bank robberies in the state by 75 percent. Agents accomplished this impressive feat by developing leads while using informants - an investigative technique which was considered innovative by many experts across the nation. In 1939, the Bureau became a division of the Department of Public Safety and was renamed the State Crime Bureau. 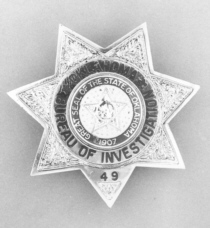 This arrangement lasted until 1957 when the Bureau was placed under the direct control of the Governor's Office and renamed the Oklahoma State Bureau of Investigation (OSBI). The OSBI remained under the Governor's direct control until the unthinkable occurred - the OSBI was called in to investigate the most powerful leader in the state. In the wake of the controversial investigation of then Governor David Hall, the agency was removed from the control of the Governor's Office. State leaders sought ways to reduce the political pressures left behind in the aftermath of the Hall investigation. In 1976, a seven-member independent commission was created to oversee the activities of the OSBI. The makeup of the Commission includes one chief of police, one sheriff, one district attorney, and four lay members. These members are appointed by the Governor and approved by the Oklahoma Senate to serve seven-year staggered terms. In general, the commission appoints the Director, hears complaints, and serves as a buffer between the Bureau and potential political pressures concerning any particular investigations. Due to limited original jurisdiction, the OSBI is primarily a requestor agency. The majority of our investigations are initiated at the request of another law enforcement or governmental entity. Currently, under Oklahoma law, only the following entities can request the OSBI's assistance: the Director of the Oklahoma State Bureau of Narcotics and Dangerous Drugs; the Chief Medical Examiner; all law enforcement officers including Police Chiefs and Sheriffs; District Attorneys; the Attorney General; the Governor; the Council on Judicial Complaints; the Director of the Department of Human Services; District Court Judges; and legislative committees with subpoena power. The OSBI has original jurisdiction in the following areas: vehicle theft, oil field theft, threats against public officials, violations of the Oklahoma Computer Crimes Act, and violent crimes committed on the state's turnpikes. On September 11th, 2002, the OSBI became the first Oklahoma state law enforcement agency to be accredited by the Commission on Accreditation of Law Enforcement (CALEA). Early 1920's - The discovery of oil led to prosperity and violence in many "boom towns" across Oklahoma. Robbery and hijacking were common, liquor joints operated openly in spite of prohibition, and gambling and prostitution went unchecked. The citizens of one town, in particular, Cromwell, appealed to Governor M.E. Trapp and former deputy marshal Bill Tilghman for help. They wrote: "I'm afraid the sheriff and county attorney will not back us up...we also have a few hijackers here, and we want to change their place of residence." Tilghman, at 72 years old, accepted the challenge. 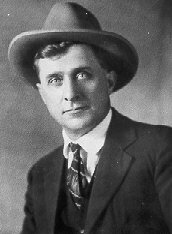 1923 - Al Spencer, outlaw and notorious bank robber, is killed after firing at a posse headed by U.S. Marshal Alvie McDonald. 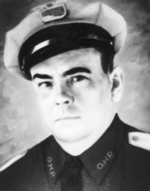 Luther Bishop, "undercover man for the State of Oklahoma," is credited with being the officer who killed Spencer. 1924 - Once in Cromwell, Tilghman soon became suspicious that local federal prohibition enforcement officer, Wiley Lynn, was taking payoffs from the bootleggers instead of arresting them. On November 1, 1924, a drunken Wiley Lynn drove into town and began shooting into the air. Tilghman grabbed Lynn and took his gun. Lynn drew a second gun from under his coat and fired twice, at point-blank range, into Tilghman's chest. Lynn fled Cromwell, followed by most of his criminal associates, who were afraid of what might happen to them as a result of the famous lawman's murder. 1925 - Tilghman's murder highlights certain problem areas for lawmen at the time - little coordination between agencies, communication difficulties between officers, and lack of a state entity which possessed statewide jurisdiction. As a result of these concerns, Governor Trapp, in his message to the Tenth Oklahoma legislature, recommends the creation of a statewide law enforcement agency. On March 28, 1925, the State Bureau of Criminal Identification and Investigation is formed. 1925 - J.G. Duncan, former superintendent for the Oklahoma State Penitentiary in McAlester, is appointed as the Bureau's first Superintendent. He leads the agency, which is staffed with three agents, one of whom is Luther Bishop. 1926 - Agent Bishop is described by a federal agent as having "been successful in putting in the penitentiary more bank robbers and other outlaws than any other man in this state." Bishop is also given credit for helping solve the "Reign of Terror of the Osage Hills" murder case in which Osage Indians were murdered for their oil money. In order to solve the case, Bishop "borrowed" convicted bank robber Blackie Thompson from the state penitentiary to use as an informant - an innovative technique for the times. 1926 - Luther Bishop is murdered by an unknown assassin. The operative of the State Bureau was riddled with bullets as he slept. 1926 - Mrs. Edith Bishop, the widow of Luther Bishop, is arrested for his murder. She is acquitted of the crime after a jury trial. The Bishop murder case is never solved. 1931 - Senate Bill 259 appropriates $2,200 to the Bureau for "evidence gathering". 1932 -Ballistics expert, C.M. Reber positively identifies bullets from a murdered service station owner as being fired from the gun of whiskey runner Arthur Haggard. 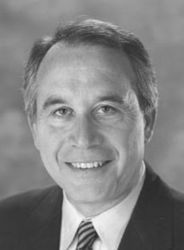 While testifying at Haggard's trial, Reber's expertise and the science of ballistics itself are attacked by defense counsel. Reber brings his microscope to court so that all parties involved in the case, including the jurors, can examine the "tiny lead pellets so vital to the case." After examining the evidence, the jury convicts Haggard of the crime and sentences him to life in prison. 1932 - Director O.P. Ray and agents Crockett Long and C.M. Reber are involved in a gunfight with Pretty Boy Floyd near Earlsboro. 1932 - Long, while in a Madill drug store, is confronted by an armed Wiley Lynn. Lynn, with his pistol already pointed at Long, challenges the lawman to a draw. Long draws his 44 caliber six-shot revolver with lightning speed, and both men begin shooting. Lynn's first shot broke one of Long's legs, but Long continued to fire even as he hit the ground. When the gunfight is over, neither man is standing. Each one was shot five times. Lynn dies twelve hours later, while Long dies on the operating table at the age of 39. 1933 - Shortly after the kidnapping of Oklahoma oilman Charles Urschel by "Machine Gun" Kelly, the Governor orders the purchase of three Thompson submachine guns for the Crime Bureau. 1935 - Agent Dee Watson conducts surveillance of the burial of Ma Barker near Welch, Oklahoma in an effort to capture "Public Enemy Number One," Alvin Karpis. 1935 - Lt. Col. Charles W. Daley is appointed as the new OSBI director. 1936 - Agent Dave McConnell is sent to the state prison at McAlester to investigate the warden following the escape of Julius Bohannon. Bohannon, who was in prison for the murder of two McCurtain County deputy sheriffs, killed a guard in the escape. 1936 - "Public Enemy Number One of the Southwest" Pete Traxler is captured after being seriously wounded by a posse near the Oklahoma-Texas border. Officers found a shotgun, a rifle, an auto pistol, several hundred rounds of ammunition, and a bulletproof vest in his car. 1937 - The agency's records are transferred to the Department of Public Safety. The Bureau maintains a full records staff, but the number of agents is reduced from 26 to 7. 1938 - The State Bureau of Criminal Identification and Investigation becomes a division of the Department of Public Safety and is renamed the "Crime Bureau". 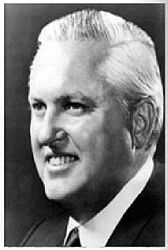 1938 - Clint Miers is appointed acting director after the resignation of Charles Daley, who had been under political fire for months. 1939 - Governor Phillips has his eye on the U.S. Marshals to enforce prohibition in Oklahoma and is quoted as saying, "I am about ready to sign a bill abolishing the Bureau effective July 1..."
1940 - The Division of Investigation is divided into three units: Technical or Identification Unit; Stolen Automobile Unit; and the Investigative Unit. Collectively, the units investigate violations of state laws, collect evidence, and serve as a clearinghouse for information to various law enforcement agencies. 1942 - Escapee Frank LeClair, at large for 27 years, is captured in Oklahoma City after his fingerprints are searched and identified by Crime Bureau Fingerprint Expert, Floyd Perryman. 1943 - Employees of the Identification Unit of the Division of Investigation are recognized by civilian and military authorities as being one of the best units in the nation. 1944 - Fingerprint files in the Division prove valuable during World War II. Fingerprints are required in naval and military enlistments, civil service employment, and all branches of defense work. 1944 - The Division of Investigation offers the services of a photographer and "operator of technical instruments" to local law enforcement. This Division also provides "photostatic" copies of instruments and documents saving the state, county, and city governments thousands of dollars. 1945 - The Division of Investigation employs 18 people. 1948 - County law enforcement officers in Oklahoma are offered the facilities and aid of the Crime Bureau in enforcing liquor laws. 1948 - Former Oklahoma City Police Detective and Sheriff's Investigator, Golden Kennedy, is hired as an agent for the Crime Bureau. While investigating the murder of an Oklahoma soldier, Kennedy traveled to New York to interview a suspect who was incarcerated on unrelated charges. After the suspect confessed to the murder, he and Kennedy began their trip back to Oklahoma. However, as the plane approached the runway, the suspect told Kennedy that his cellmate had, just the night before, confessed to a nearby bank robbery. Kennedy had the pilot turn the Bureau plane around so that he could provide the information to the local authorities. The local police were quite pleased to have the bank robbery solved, and Kennedy returned his suspect to Oklahoma where the suspect later pleads guilty and receives a life sentence for the death of the soldier. 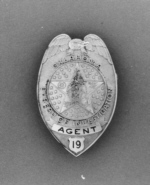 1949 - The Bureau establishes an office in Tulsa - one agent is assigned to the Tulsa district. 1960 - On January 31, OSBI Director Forrest Castle admonishes his agents to enforce the vice laws impartially after rumors of payoffs among law enforcement officers. The Director advises agents to work in pairs to avoid setups. Subsequently, a change in crime bureau policy allows state agents to make vice raids without being requested by county officials. 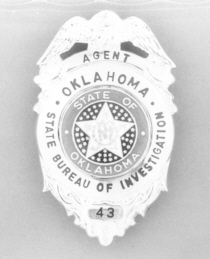 1961 - The OSBI, with only 16 agents, recovers property valued at $376,119 and receives 2,191 calls for assistance from other agencies. The agents work for $450 a month. Director Ralph Venamon requests their salaries be raised to $500 per month. 1961 - Six agents are fired as the result of new state legislation which requires the Bureau to consist of only a director, assistant director, and ten agents. 1962 - Six Brand Rangers of the Board of Agriculture are commissioned by the OSBI. 1962 - The OSBI receives a new mobile laboratory. 1963 - The Regulated Drug Enforcement Division of the State Attorney General's Office is transferred to the OSBI. 1963 - Eight agents, under the leadership of Fred Graves, investigate the murder of a sheriff's deputy near the town of Dogpatch. The deputy was gunned down in an ambush, and because Dogpatch was gripped by fear of lawlessness, citizens were reluctant to cooperate with local officials. As a result, the Bureau was called in. After the conviction of the man responsible for the deputy's murder, Graves tells newspaper reporters, "We wanted the people to know there was law and order, and there was going to be law and order even when we left." 1965 - The annual budget of the OSBI is $298,000. 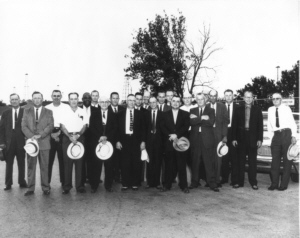 1966 - Four OSBI agents resign and others are looking for jobs because of a lack of job security. 1966 - Governor Bellmon publicly recognizes that the "gambling games" occurring at the Oklahoma State Penitentiary, and controlled by the warden, have been stopped due to an OSBI investigation. 1968 - Governor Bartlett directs that the National Crime Information Center (NCIC) terminal for the state be installed at OSBI Headquarters. 1968 - All Bureau employees are placed under the merit system. 1969 - Ruth Schier, the first woman to appear on the FBI's Ten Most Wanted List, is arrested in Norman, Oklahoma after fingerprint experts at the OSBI positively identify her as a recent job applicant at Central State Hospital. 1990 - Employee awards program is instituted to recognize outstanding service. 1991 - Information Services Division is created as the fourth division within the OSBI. Its purpose is to handle the increased demand for information by law enforcement and the public. 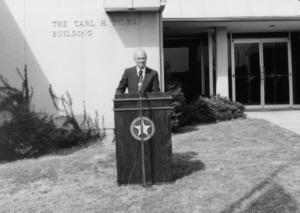 1991 - Construction begins on a new Eastern Regional Laboratory and Investigative Office in McAlester. 1991 - The Special Investigations Unit is created to investigate public corruption, government fraud, and other white-collar cases. 1991 - Senate Bill 386 authorizes the establishment of a DNA analysis unit with the OSBI Central Laboratory. 1992 - 8,000 square feet is renovated at OSBI Headquarters to make way for the new Automated Fingerprint Identification System (AFIS). 1992 - Construction begins on a new Southwest Regional Laboratory and Investigative Office in Lawton. 1993 - The Criminal Information Unit expands its role to become the state clearinghouse for information on missing children. 1993 - The Special Investigations Unit completes its 14-month probe into the 1990 campaign contributions of Governor David Walters. Unlike the previous investigation of then Governor Hall, the Walters investigation proceeds without any OSBI employees losing their jobs. The OSBI Commission's purpose as an insulator to the bureau from political influence and pressure is solidified. 1994 - OSBI Agents are equipped with laptop computers to aid in report writing, case management, and other investigative functions. 1994 - In May, installation is completed on the OSBI's multimillion-dollar Automated Fingerprint Identification Unit. This technological advancement provides the OSBI with a faster response time in identifying latent fingerprints found at crimes where unidentified prints are found. The system was formally dedicated in the memory of Tracey Neilson, who was stabbed to death in her Moore apartment on her 21st birthday in 1981. Her killer has never been found. Before the acquisition of the AFIS system, the OSBI could only search for a latent match if the suspect's name was known. Now, all local law enforcement need to provide is a latent print or partial print, and the OSBI can search its entire database of 4.5 million fingerprints within minutes. Although a latent fingerprint expert is still needed to make the actual match, the AFIS system can narrow down the search to as few as ten possible suspects. 1994 - The OSBI Central Laboratory begins accepting cases in its DNA Profiling Section. 1995 - Passage of the Oklahoma Self-Defense Act authorizes the OSBI to license eligible Oklahomans who wish to carry a concealed weapon. During the first year, more than 13,000 applications are processed by the bureau. 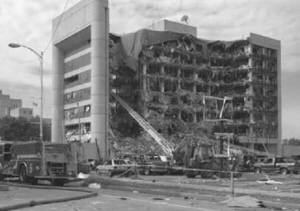 1995 - April 19th, twenty minutes after a bomb ripped through the heart of downtown Oklahoma City, and hours before anyone knew exactly what had happened, OSBI Director A. DeWade Langley sends out a request for all available OSBI agents to respond to the scene at the Alfred P. Murrah Building. Forty agents from across the state respond. That evening, agents man phones at the Mayor's office, taking calls and leads from anyone who had been inside the building or near it at the time of the blast. The goals are to find out if anyone saw or heard anything unusual before the bomb exploded and to account for those people who were or were not in the building when the bomb exploded. These same agents field numerous leads until the Federal Bureau of Investigation is able to set up a command post. This assignment lasts more than three weeks. OSBI Laboratory employees are also called out to aid in the collection of crime scene evidence and to take crime scene photos. Criminalists keep the Central Lab open late to allow Alcohol, Tobacco and Firearms' agents to examine the collected evidence. OSBI Latent Fingerprint Technicians had the difficult task of identifying many of the children who died in the bombing. While most adult bombing victims were identified by dental records, many of the children were not old enough to have such records. They had to be identified by fingerprints. Bureau employees had to go to the home of these children to dust toys and other belongings. This method helped identify 12 of the 19 children who died in the blast. 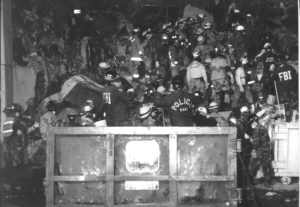 Seventy-three OSBI employees worked directly on the bombing case. This agency is proud of their professionalism and their dedication to furthering the agency's mission, especially in such a difficult case. 1995 - Three-year-old Ryan Aubrey Luke dies, and OSBI Agents investigate the murder. The crime and subsequent public outcry spawn the "Ryan Luke Bill" to protect Oklahoma children. 1996 - The Criminal Intelligence Unit is statutorily created and is authorized to collect, analyze, and disseminate intelligence information to law enforcement for use of criminal investigations and crime prevention. 1996 - The OSBI Central Laboratory is authorized to begin collecting the DNA profiles of all persons convicted of certain violent crimes in the state. 1997 - The Firearms and Toolmarks Unit of the OSBI Laboratory installs a new electronic database and image capture system. "Drugfire" is designed to allow firearms examiners to enter, store, search, retrieve, and share information from fired casings and bullets. 1998 - "The Shadow," a new tracking device, is unveiled by the Investigative Services Division. The new tool can be used to track a targeted suspect vehicle within 75 yards of its exact location. 1999 - A new DNA profiling technique called PCR-STR is being used in the Criminalistic Services Division. The new technique is automated and not as labor intensive. It can run tests on biological samples in half an hour or less. 1998 - The OSBI joins the Metro Fugitive Apprehension Task Force which is designed to track and arrest fugitives in the Oklahoma City metro and around the state. 1999 - Construction is completed on the Northeastern Regional Laboratory and Investigative Offices in Tahlequah. 1999 - The OSBI goes online with its website offering agency information, job postings, and forms for Criminal History Records requests and the Oklahoma Self-Defense Act. 1999 - Two Agents complete training in computer forensics. 1999 - Work begins on a multimillion-dollar computer upgrade of AFIS. 1999 - Eastern Oklahoma is outraged when an 80-year-old wheelchair bound man and his 75-year-old wife are murdered in their rural McIntosh County home. Three OSBI agents, two OSBI serologists, and two OSBI fingerprint experts investigate the case. The suspects are charged within three days.